A walk along the first (or perhaps more commonly the last) section of the Thames Path National Trail, from the Thames Barrier to London Bridge. The official description of the Thames Path promises “peaceful water meadows, unspoilt rural villages” – but not on this section, which starts amid working wharves and scrap yards. 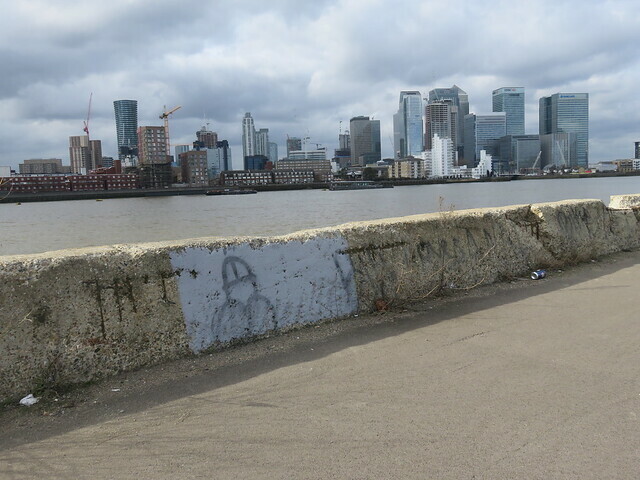 The route then runs past building sites, is diverted alongside an unpleasant main road, has an historical interlude as it cuts through the tourist crowds of Greenwich, and then dodges slightly tediously to and from the riverbank as it runs behind London flats. There is some artwork of various kinds along the route, including some odd statues. The Dog & Bell was a nice pub, while the Mayflower would be nice if everyone else wasn’t there as well!